Stock # PEB94989, Intercooled Turbo Diesel V-8 6.7 L/406, Automatic, 37215 mi. CARFAX 1-Owner. 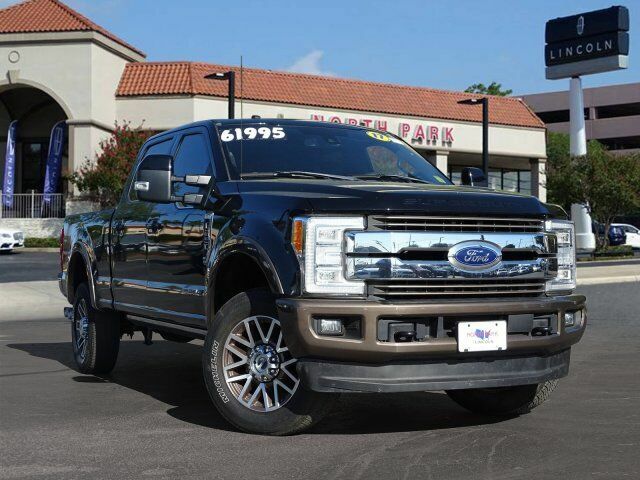 Heated/Cooled Leather Seats, Sunroof, NAV, ELECTRONIC-LOCKING W/3.55 AXLE RATIO, ENGINE: 6.7L 4V OHV POWER STROKE V8 TURBO DIESEL B20,4x4, Turbo, Tow Hitch, REAR INFLATABLE SEAT BELTS, WHEELS: 20 BRIGHT MACHINED CAST ALUM... TIRES: LT275/65RX18E BSW A/S CLICK ME! Leather Seats, Navigation, 4x4, Heated Driver Seat, Cooled Driver Seat, Back-Up Camera, Premium Sound System, Satellite Radio, iPod/MP3 Input, Onboard Communications System, Trailer Hitch, Remote Engine Start, Dual Zone A/C, WiFi Hotspot, Smart Device Integration. MP3 Player, Keyless Entry, Privacy Glass, Steering Wheel Controls, Electronic Stability Control. ENGINE: 6.7L 4V OHV POWER STROKE V8 TURBO DIESEL B20 4 valve OHV, manual push-button engine-exhaust braking and intelligent oil-life monitor, 34 Gallon Fuel Tank, Extra Heavy-Duty 220 Amp Alternator, 3.31 Axle Ratio, Dual 78-AH 750 CCA Batteries, KING RANCH ULTIMATE PACKAGE Twin Panel Power Moonroof, map lights and moonroof switches, Multi-Contour Seats, Power-Deployable Running Boards, Blind Spot Information System (BLIS), cross-traffic alert and trailer tow (BLIS sensor in taillamp), Tailgate Step & Handle, Quad Beam LED Headlamps & LED Taillamps, LED fog lamps and LED Center High-Mounted Stop Lamp (CHMSL), WHEELS: 20 BRIGHT MACHINED CAST ALUMINUM light caribou painted pockets and light caribou wheel ornaments w/King Ranch logo, ADAPTIVE CRUISE CONTROL & COLLISION WARNING brake support, ELECTRONIC-LOCKING W/3.55 AXLE RATIO, HEATED REAR SEATS, REAR INFLATABLE SEAT BELTS, TRANSMISSION: TORQSHIFT 6-SPEED AUTOMATIC (6R140), SelectShift, TIRES: LT275/65RX18E BSW A/S (STD). Ford King Ranch with Shadow Black exterior and Java interior features a 8 Cylinder Engine with 440 HP at 2800 RPM*.